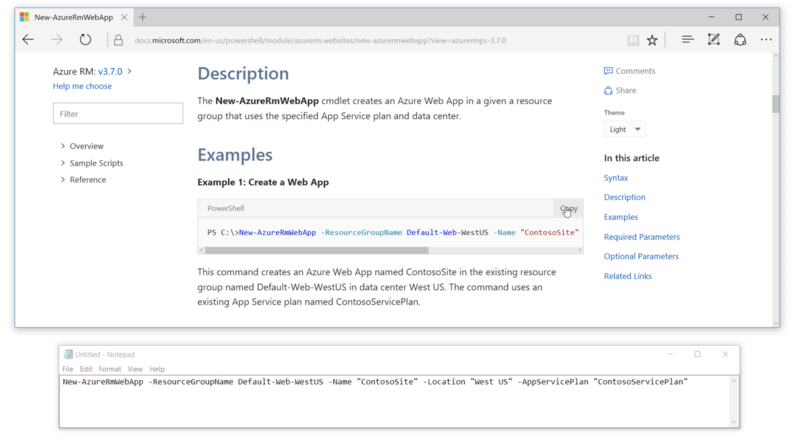 Today we launched our revamped Azure PowerShell experience for docs.microsoft.com. Improvements to this experience include module versioning, code syntax highlighting, easier-to-navigate table of contents, the ability to edit and improve docs, and more. We know from customer feedback that PowerShell content has been an area for improvement and this is the next step in our journey to improve the quality of our content. 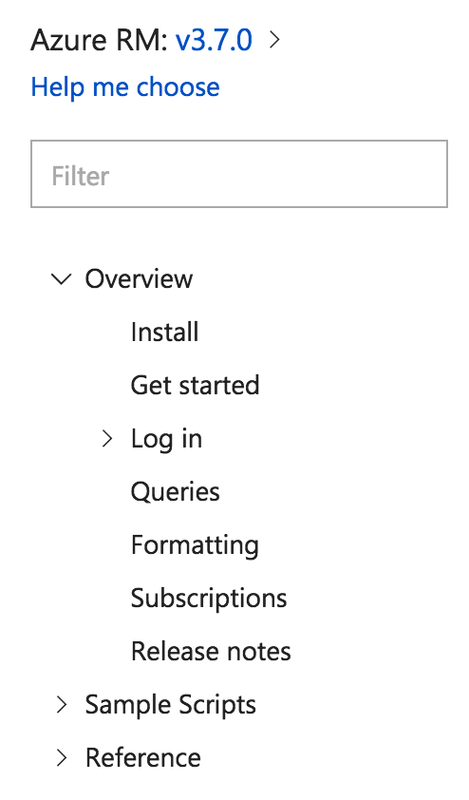 We've started with Azure, but will be moving all of our PowerShell content to this experience in the coming months. Consistent user experience - Formatting for modules, cmdlets, and samples is now the same across the entire PowerShell documentation experience. Easy contributions - PowerShell users can add code samples or edit our reference docs by clicking the Edit button directly on the doc page. Support for versioning for previous versions of PowerShell - To filter on a specific version of Azure PowerShell, use our in-page version picker. While we mentioned versioning for a specific module, some modules ship as a group of other modules, each with their own separate versioning scheme. For example, customers download Azure PowerShell through PowerShellGet. In the past customers had to manually decipher which versions of the docs applies to their installation. 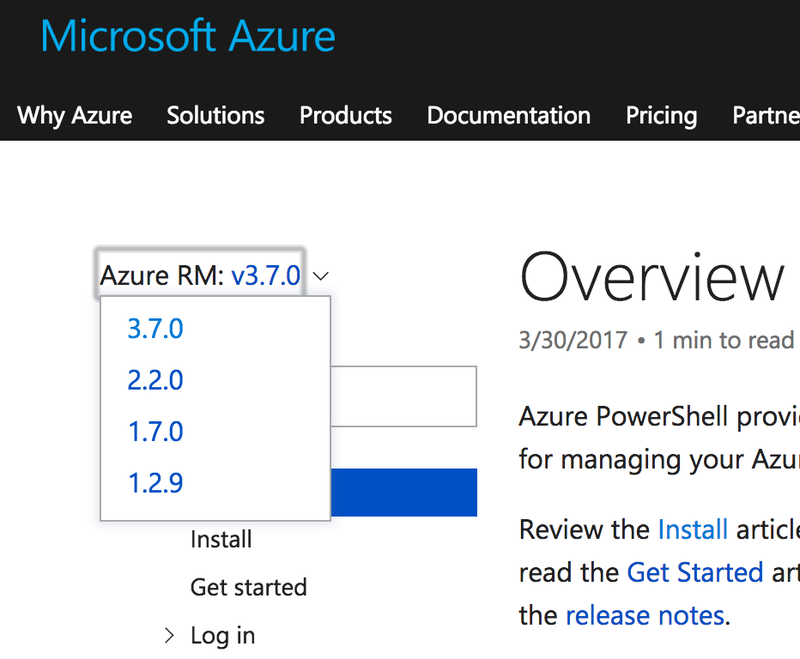 For example, if you installed Azure PowerShell 3.7, you would have to know each individual module that AzureRM 3.7 ships with AzureRM.Automation 2.7 and AzureRM.CognitiveServices v0.5.0 and look for those docs. With our new experience you just have one version to pick and we will filter the correct modules based on what you have installed. In addition to cmdlet reference, we added overview content, installation steps, getting started, and samples. 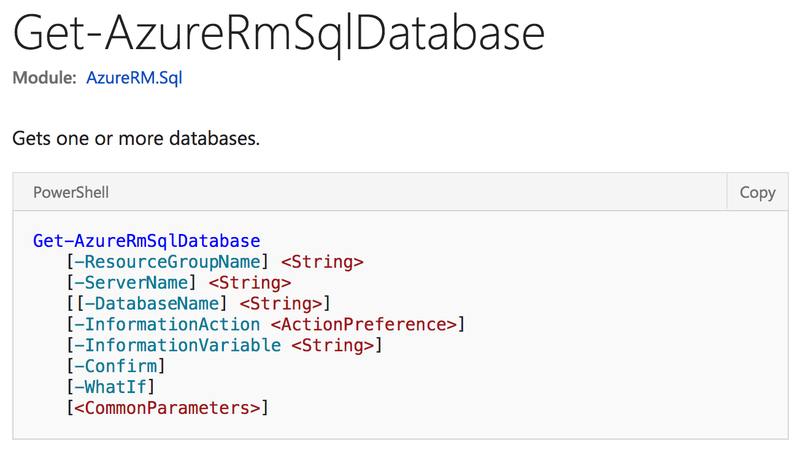 For Azure reference, we also grouped cmdlets based on Azure Service. You can easily filter the left TOC as you type for matching cmdlets or services matching that name. PowerShell cmdlets are now nicely colorized and formatted for better readability. 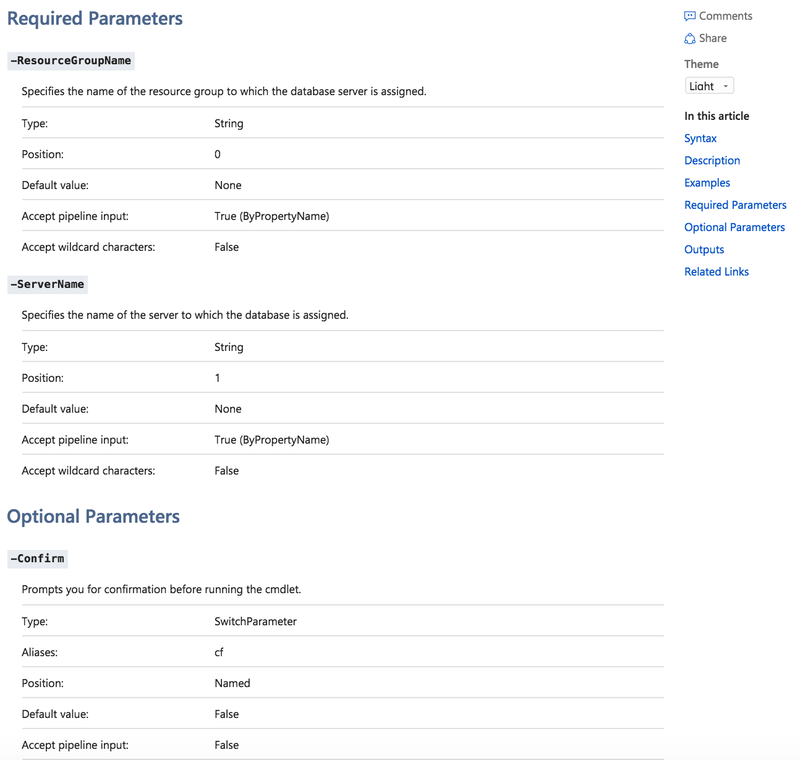 While we previously grouped parameters by whether they were required or optional, the parameter list appeared unordered. Instead we added section headings to group required parameters and optional parameters and improved the colorization/style for parameter names. A number of our PowerShell cmdlets code samples are prefixed with the text PS C:\>. When you click the Copy button for the code example, we will now strip away the PS C:\> prefix, as shown in Notepad screenshot below. We hope that you see significant improvements with this release. We are not finished with our vision yet, so please send us your feedback via our Docs UserVoice.